Not just his house, but his Ford Ikon car as well as his Activa both adorn the colours of the team that Sudheer worships. 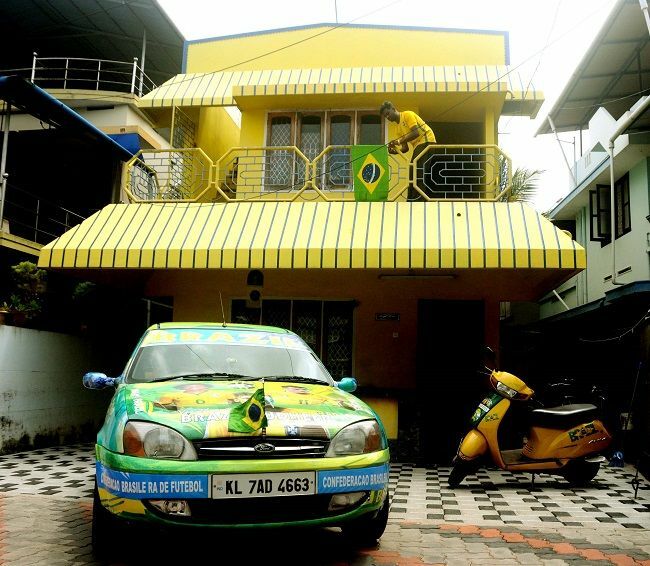 It is no secret to the people of Kollam that Sudheer is a die-hard fan of the Brazil football team. With the FIFA World Cup frenzy kicking in across Kerala, the captain of the Kollam stadium football team has now upped the game by immersing himself in Brazilian colours. The 41-year-old is referred to as ‘Brazil Sudheer’ by the people of Pallimukku where he resides, and now it seems people have more reasons to stick to the name. Sudheer has painted his two-storey house in yellow and blue, the colours of the Brazilian flag. Not just his house, but his Ford Ikon car as well as his Activa both adorn the colours of the team that Sudheer worships. Speaking to TNM, Brazil Sudheer says that the World Cup frenzy has already hit the rooftop! “This time, we are all confident that Brazil will lift the cup. That’s why I have done so much this time around,” Sudheer says, adding that he will stick to wearing the team jersey until the World Cup concludes. 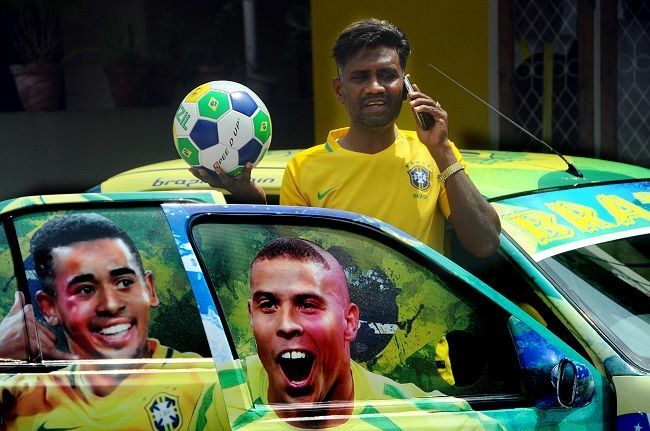 Sudheer’s car and bike are now painted with the faces of the leading players of the Brazil team – Neymar, Philippe Coutinho, Marcelo, Casimiro, Gabriel Jesus, Ronaldo and Roberto Carlos. This is not the first time Sudheer – who runs a juice shop – has given a Brazilian makeover to his belongings. But this is definitely the first time that he has spent so much money on displaying his passion. “I have been giving a makeover to my car for the past four World Cup games. I used to do that by using stickers and faces of the players on my car. This time, since I am so confident of the win, I painted my house a few months ago in preparation for the World Cup. And this time we have used paints and stickers even on my bike,” he says. In all, Sudheer spent a whopping Rs 56,000 for making modifications on his car alone, and says that he has taken permission from the Motor Vehicles department to maintain the vehicles in this condition for another year. “No doubt the team will win this time and I am going to keep the modifications for at least a year. My family is very supportive of whatever I do, but then if they know I have spent so much money on this, I am not sure they will approve. But after all, everything is for the team,” Sudheer says.